Please re-direct to this page to continue to follow the Blake and Sean Diaries. Blake has resumed training back home in Sydney with his brother Sean, Sean will return to Baylor for 2nd summer session next week. The 49ers Rookies took a tour of Facebook headquarters. Footage of the tour can be seen in this link to the 49ers website. Check out the gallery of 49ers rookie players taking in the sights on San Francisco before breaking for summer. From a few days ago, Blake at practice with Coach Clements. The 49ers have one more day of their 3 day mini camp before breaking for summer. Blake will then get a chance to return home. So highlights of day #2 can be found below, you'll see a few highlights of Blake wearing #69 in it. Baylor's new Head Coach Jim Grobe has spoken to the media for the first time. Meanwhile in Santa Clara where the 49ers have their training facility, this is the break down of 1st, 2nd and 3rd team OL on OTA's as reported on Ninersnation. 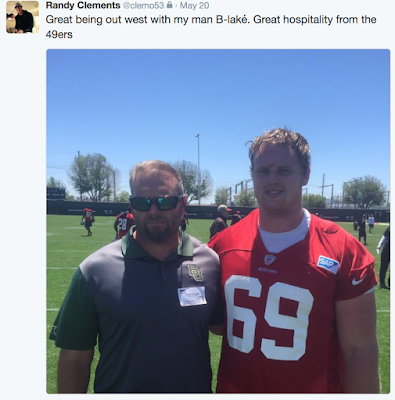 The 49ers have 3 days of mandatory mini camp next week before breaking over the summer break for 6 weeks. Baylor has welcomed new Head Coach Jim Grobe to take over for the 2016 season.